being MVP: Zuo Modern Contemporary: Baby Anime Chairs & Giveaway! 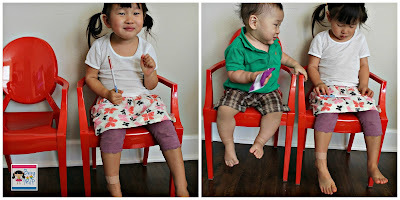 Zuo Modern Contemporary: Baby Anime Chairs & Giveaway! My dream house would have floor to ceiling windows with at least 180 views of the ocean and be decorated in an ultra modern design. What would fit right in are the Baby Anime chairs we received for review from Zuo. These are really chic chairs for tots and are made of sturdy polycarbonate which is also very light. Kenzie can easily carry these around the house and set up her area just the way she likes. Mason was immediately drawn to the Baby Anime chairs and after crawling over at lightening speed, proceeds to climb on. He likes to stand on them and peer over the ledge. He is supervised at all times, of course. These are actually great for both indoors and outdoors. They are easily wiped down and do not seem like they would fade from the sunlight. I love the modern glossy look. The pop of red (Hubs' favorite color) is a great contrast to our dark floors and dark gray couch. I would actually love the transparent set as well. Zuo offers contemporary furniture and furnishings for every room in your home. I would love to redo several rooms in Zuo - what do you think about my inspiration board? Buy It: You can purchase the Zuo Modern Baby Anime Chair - Set of 2, Red for $220. Make sure to connect with Zuo on Facebook and Twitter! One Winner will Receive a Set of Baby Anime Chairs from Zuo! Love the black office chair! I am in need of a new one! I really like the Catalan Chair. I love the criss cross office chair! I LOVE the Haight Ashbury Table!!!! I love the Phante chair! I love the baby S chairs! So adorable! Love the sleek and modern look of their pieces! I love the Axiom Sofa, the Cowboy Blue color is just gorgeous! I love the Cinto Bar Set! I love the Pup Chair! I love the Catalan Chair! I love the Cosmic Floor Lamp. I like the Bang mirror. I like the Baby S chairs!!! I love the wacky table! I love the Twin Peaks Bar Chair! I also like the propulsion ceiling lamp. I like the Zuo modern baby S chair in orange. Love the Baby S Chair! Love the Xert Serving Cart! Would love the Cabo Chair for outdoors! would be so fun in our yard! I like the roco table. my girls would love to sit on the phante chair! Really cute! I want the Union Jack Armchair! I love the Orebro Chair! love the union jack armchair! I love the Barbary Coast Cart Table! I like the kids wacky table!